I recently…wait, first…sorry for the lack of posts lately. OK, back to the goodies. I recently handled the drink menu and service for a nice party in Telluride. I had a ton of fun and when I was heading back home the party planner gave me a bunch of cheeses and charcuterie to take back to the desert. She gave me a monster block of awesome gouda and since I was only home for a little bit I was kind of in a rush to use this gouda and do justice to it. I think I will buy some more and use this recipe for the opening weekend of football. Follow the directions on the noodles. Cook them. Rinse them. Set aside. In large pan melt the butter over medium high heat. Add the milk and heat until almost boiling. Reduce heat to medium and slowly sprinkle in flour. Whisk constantly over medium heat for 1-2 minutes. The mixture will thicken and that’s when you know you are succeeding. Slowly add the cream while whisking the thickening mixture. Add the salt, pepper, mustard, hot sauce, and worcestershire sauce. Lower the heat and continue to whisk for around 5 minutes. Add your cheeses and whisk while it melts. Add cooked macaroni to cheese mixture and pour it into a 13×9 buttered dish. Add melted butter to 2 cups of panko bread crumbs. Stir ip up real good and use this to top you mac and cheese before baking. Sometimes I skip the topping but people seem to enjoy it. Sprinkle the bacon on top if you are using it…and you should. Alternately, you can mix the bacon into the cheese mixture before topping which is awesome too. Bake your mac and cheese uncovered at 375 for 25-30 minutes. “Nam Prik Dang” is fun to say and I have no idea what it translates as, it must be something like “Awesome Sauce”. Thai flavors are my favorite of the all the Asian cuisines. I love the bright and sharp notes they like to bring out. This sauce works great with many things, I love it on fish, rice, or my finger. If you wonder how to make that tasty sauce they bring to your table at your local Thai restaurant here is one gringos take on it. 24 Thai red chili peppers, sliced thin. You can use green too if you like but red have a sweeter flavor. Mix everything in your blender and throw it in the fridge until you need it. OK, so maybe that isn’t your thing and you like the sweet chili sauce from the store or the kind more commonly found at fast food Asian restaurants. Try this! Add the first bit of water, rice vinegar, and sugar to a sauce pan over medium-high heat. As soon as the mixtures starts to boil add the garlic, ginger, and red pepper flakes. Immediately set the pan to simmer and let it go for another five minutes. Add the Sriracha. In a small bowl, mix the cornstarch and 2 T of cold water and dissolve the cornstarch. Bring the sauce to a slow boil again and add the cornstarch mixture slowly while stirring constantly and then add the salt. The sauce will start to thicken up right away. Stir constantly until the mixture reaches desired thickness. The will take anywhere between 2-5 minutes. I like it thick so I let it go longer. Let the sauce cool and then put it in the fridge. Use it as a sauce for dipping egg rolls, shrimp, or chicken skewers. It’s Super Bowl time and people have asked for some recipes for the big day…so we will gladly post a few.We call this one Nitro BBQ Sauce, no real reason it just sounds good. This is a great sweet BBQ sauce that gets it’s nice acidic zing from lemon juice. It is really easy to make and you should mix up a batch for your pary or take some to the party you are going to. BBQ sauce is a great thing to give the host and this will beat whatever store bought crap they have. Combine all ingredients. Bring to boil and reduce heat to lowest setting and continue to heat until slightly thickened. It should take about 15 minutes. Use right away or let cool and store for up to two weeks in a sealed container. There are few recipes I have tweaked and messed around with more over the years than Mac & Cheese. I like a good dense Mac & Cheese with a breadcrumb crust sometimes, but other times I opt for this creamy version which is great for a chilly night. This recipe lends itself well to adding bacon, onions, jalapenos, or any number of delicious things. Feel free to get creative after you have seen what you have here and let me know how it goes. – Preheat your oven to 350° and put the rack in the middle position. – Cook your pasta while making the cheese sauce. Cook the noodles until just barely done [al dente]. The noodles will finish cooking in the oven. When noodles are done boiling rinse and toss with cold water and set aside. – Cheese Sauce: In a large saucepan melt the butter over medium heat. Slowly whisk in the flour and continue to whisk [making a roux] and cook for about 2 minutes. – Slowly add the milk while whisking constantly, make sure to get out lumps before adding more milk. When all the milk has been added continue cooking and stirring frequently until the sauce thickens, this takes about 8-10 minutes. Be patient, you will be able to tell when the thickening happens. – Turn off the heat under the saucepan. Add the cheese, salt, chili powder and garlic powder. Stir until the cheese is melted and all the ingredients are incorporated, about 3 minutes. Set aside. – Butter [or spray] an 8-inch square baking dish, an 8-inch cast-iron skillet or individual baking dishes. – Add the cooked pasta and to the cheese sauce and mix thoroughly but gently. It will look like there is a lot of cheese sauce but remember this is a CREAMY Mac & Cheese. – Scoop the mixture into your prepared baking dish [or individual dishes]. 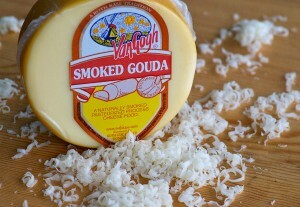 Sprinkle the top with a bit of additional grated sharp cheddar. Just a little, it’s already cheesy this just help to form a nice top. – Bake uncovered in the oven for 20 to 25 minutes. The sauce should be bubbly around the edges and there will be nice golden crust on top. – Remove from oven and let set for a few minutes before serving. I love wings. 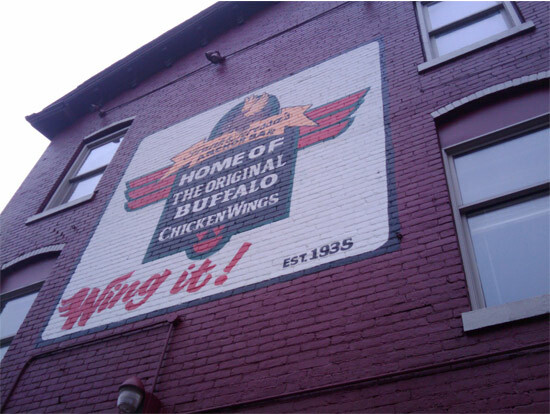 I love wings so much that one time I flew to Buffalo just to eat them at the Anchor Bar where they were invented. I am not kidding. That my friends is love! There is a lot to love about wings. The heat, the texture, the fatty goo, and so much more. It is definitely animal style eating. They are great deep fried, smoked, or grilled. Some jerks even bake them…I don’t know why, but they do. In this recipe I tried to take the great taste of one of my favorite things and adapt it into one of my other favorite things…DIP! This is a super duper easy dip to make and it might just be appropriate for your playoff party this weekend. If you don’t know what playoffs I am talking about I am saddened by your anti American way of life. Here is a picture of the glorious birthplace of the Buffalo Wing. 2/3 cup Pabst or another lighter beer of your choice. Don’t use a dark beer. Heat olive oil in a pan over medium to high heat, add the chicken and cook it until it is done and has browned a bit. This should take around 6 minutes. In your blender, food processor, or with a mixer combine the sour cream, cream cheese, Parmesan, Texas Pete’s, beer, garlic and onion powder, black pepper, and cornstarch. Let it spin around until it is one cohesive mixture. About 3 minutes should be good but go longer if needed. Pour this luxurious goo into an baking dish. Now stir in chicken and sprinkle the top with your mozzarella. Bake until the cheese is starting to bubble and it’s warm throughout. 15-20 minutes. Remove the dish from your oven and sprinkle with blue cheese crumbles and garnish. Serve right away with chips. posted by admin in Recipes and have Comments Off on BEER N’ BUFFALO DIP – Get The Party Started. I made these on a morning news programs. You can’t go wrong with this simple taco recipe. Blend all the marinade ingredients. You will have about 1-1/2 cups marinade. This recipe is enough for 1 steak at about 1.5 to 2lbs. Adjust accordingly. Put steak and marinade in a large, locking plastic bag and squeeze out as much air as possible. Refrigerate for 24 hours Turn and jostle occasionally for best results. Remove the steak from the refrigerator about 1 hour before grilling. Remove the steak from marinade and let excess drop off. Discard the marinade. Put the steak over a hot grill and grill until browned, about 4 minutes. Roatate 90 degrees after 2 minutes of cooking if you want cross-hatching on the steak. Flip the steak and grill another 4 minutes for medium rare. Let steak rest 5 minutes, then slice against the grain into 1/4-inch slices. Serve on warmed corn tortillas with some onion/cilantro/lime relish, salsa, and cojita cheese on top. Warm the tortillas on the grill or in a cast iron pan until pliable. Use a microwave as a last resort. You want a little scorch or these puppies. Mix it all up and chill it. I have 4 different jerk recipes I use for meat. I like this one when cooking for a bunch of people who may not all be adventurous eaters. This is pretty straight up flavor-wise and tastes great! Jerk seasoning is a Jamaican thing but I have enjoyed it throughout the Caribbean. This recipe was passed along to me from a Jamaican I met in Puerto Rico. I love it. A couple pounds of assorted pieces of chicken. You can use pre cut up pieces or even boneless pieces. If you use breasts, pound them out to an even thickness. 1 – Place all the marinade ingredients into the blender and process until smooth. 2 – Place the chicken into 2 large Ziploc bags. Pour 1/2 of the marinade into each bag. Seal bags and press out as much air as possible. Refrigerate 24 hours. 3 – Remove chicken from the refrigerator and allow to come to room temperature. Set up a two zone fire. Do this by putting all the charcoal on one side only or if you are using a gas grill only light one side. 4 – Place the chicken on the hot side of the grill and cook until well browned on all sides. Move the chicken to the cooler side of the grill and cover. 5 – Continue to cook until chicken until it is cooked all the way through, 20-30 minutes and 165 degrees. 6 – Remove the chicken from grill, allow to cool for 5 minutes, and serve. The key to this classic sauce is simplicity. This is a BBQ standard and works amazing on pulled pork. Mix all the ingredients and chill overnight. Keeps forever. I have never been a huge fan of Guinness. I find stout beers too heavy and the pay off is a ABV [alcohol by volune] of less than 5%. It pretty much is the same as Leinenkugels which in this professionals opinion is far superior. What I have found these heavy beers work for is cooking. If you cook down 3 pints of Guinness you can make a great base for ice cream and it lends itself well to things like cupcakes as well. I don’t eat much ice cream or cupcakes but I do enjoy BBQ sauce and I am always experimenting and looking for a new recipes to put into production. Here is a recipe that is well on it’s way to consideration for bottling. 1. Heat the oil in a saucepan over medium/high heat. When it is hot add the onion and cook until softened, 6-8 minutes. 2. Add the tomato sauce, beer, molasses, mustard, vinegar, brown sugar, Worcestershire sauce, salt, pepper, hot sauce, garlic, and onion. Bring the mixture to a boil and then reduce to simmer. Reduce the sauce slowly for 30 to 45 minutes until it thickens up nicely, make sure to stir it every now and then so it doesn’t stick or burn. 3. Check the flavor and add salt/or pepper as necessary. 4. Put the sauce to a blender and puree until very smooth. BE VERY CAREFUL! Hot stuff in a blender will fly all over your kitchen. Start on slow and gradually increase the speed or let it cool a bit first. If you just can’t wait throw a hand towel over the top of the blender just in case. 6. This sauce will keep in the fridge for a few weeks. Great for all kinds of meat!